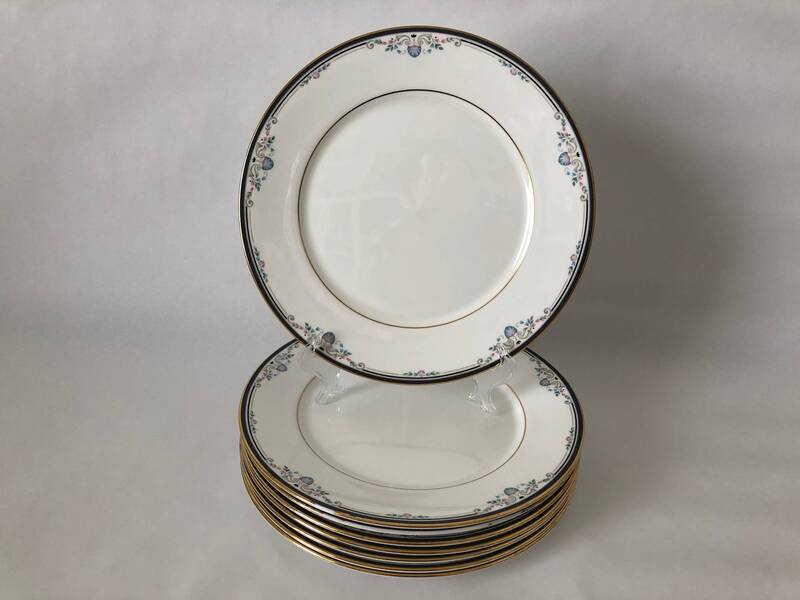 The Sabrina pattern of this set of 8 Lenox dinner plates was produced for 4 years between 1991-95, and is a classical looking pattern featuring a midnight blue band with blue shell designs with pink shading and gray scroll work. These plates ad elegance to a table setting, but can be dressed up or down depending on the accessory dishes, glassware, flatware and linens you choose to use with them. Each plate measures just shy of 11" wide giving you a larger than average surface to accommodate a serving of everything at even the most sumptuous feast. The plates appear to be in general lightly used without scratches or fading, but most of them have experienced some kind of friction to their edges that has removed small and sometimes rather long swaths of gold edging. However, since the gold edging was not designed to be wide or to show a lot from the top this is not as deal breaking a flaw as it could be with some patterns that were designed with thicker bands of edging on the tops of the plates. I have attempted to show many of the areas of gold loss in the photos and have also pictured how the plates look in combination with other pieces in place settings on a table. I have kept the price exceptionally low on this fine made in the USA set of 8 Lenox dinner plates to compensate for the gold edging loss. 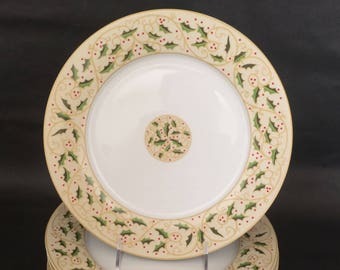 The companion pieces of this dish pattern that will be listed separately are in generally more perfect condition to distract even more from the flaws in the dinner plates if you like the matched looked in the table setting photos. Overall this set of plates offers a great opportunity to own and use some high quality porcelain at a great low price.